Scientists Use Antacid To Help Measure The Rate Of Reef Growth : The Two-Way There's some evidence that carbon dioxide we pump into the atmosphere has slowed the development of coral reefs. So researchers are adding antacid to the water in a tiny part of the Great Barrier Reef, to see whether the corals will grow faster if their water supply is less acidic. Ken Caldeira of the Carnegie Institution for Science takes a water sample during his experiment out on part of the Great Barrier Reef. The water is slightly pink because his team is using a dye to trace an acid-neutralizing chemical as it flows across the reef. NPR Science Correspondent Richard Harris traveled to Australia's Great Barrier Reef to find out how the coral reefs are coping with increased water temperature and increasing ocean acidity, brought about by our burning of fossil fuels. Day 4: Richard catches up with one of the gurus of climate science out on the reef. Ken Caldeira loves a challenge, and he has a big one right under his feet. He's standing on an expanse of coral reef out in Australia's Great Barrier Reef. It's being washed with water as the tide streams over the reef, from a lagoon to the open sea. Day 1: A Canary In The Coal Mine For Coral Reefs? His big question centers on understanding how the carbon dioxide we add to the atmosphere is affecting coral reefs. The immediate — and logistically daunting — challenge is to measure how fast this bit of reef is growing. He and a team are preparing to pump a chemical solution across the reef that he hopes will give that growth a bit of a boost. This chunk of coral reef, located near One Tree Island, is about one-third the size of a football field. Caldeira, who is from the Carnegie Institution for Science, figures it will put on about a pound of growth in an hour. The coral and certain algae grab calcium carbonate out of the water and use it to build their stony skeletons. There's plenty at stake here. The oceans have become about 30 percent more acidic in the past 200 years because some of the carbon dioxide from our tailpipes, smokestacks and chimneys has dissolved in the sea. There's some evidence that has slowed the growth of coral reefs. So Caldeira is adding an antacid to the water that flows over this reef, to see whether the corals will grow faster if their water supply is less acidic. His hypothesis is the reef will put on an extra ounce or two in these more favorable conditions. He can't put the reef on a scale, of course. But he can infer how much the reef has grown by measuring tiny chemical differences in the water before and after it washes across the reef. 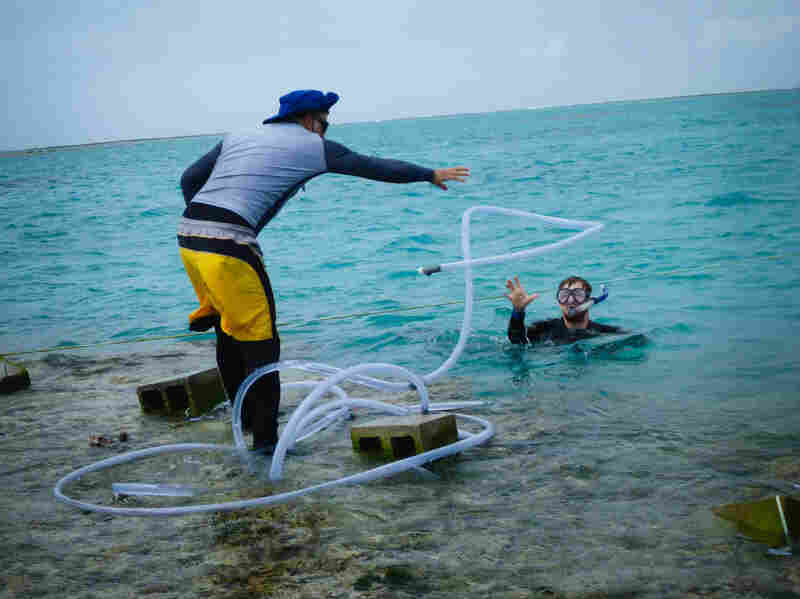 Caldeira (left) tosses some plastic tubing that will pipe in the antacid, mixed with nontoxic red dye, from a floating tank nearby to see whether the reef will grow faster under less-acidic conditions. His instruments can measure chemical changes less than one part per billion (which is like detecting a single drop in an Olympic swimming pool). But the water doesn't flow across the reef in a smooth and even sheet. There are fast streams and slower meanders. Sometimes the sun shines bright. Sometimes the wind blows strong. All this affects the reef's growth rate. This is the perennial challenge of field research: finding a change that stands out beyond the normal variation. Scientists say they're looking for a signal that rises above the noise. The tried-and-true technique: Measure. Then measure again. And again, and again. 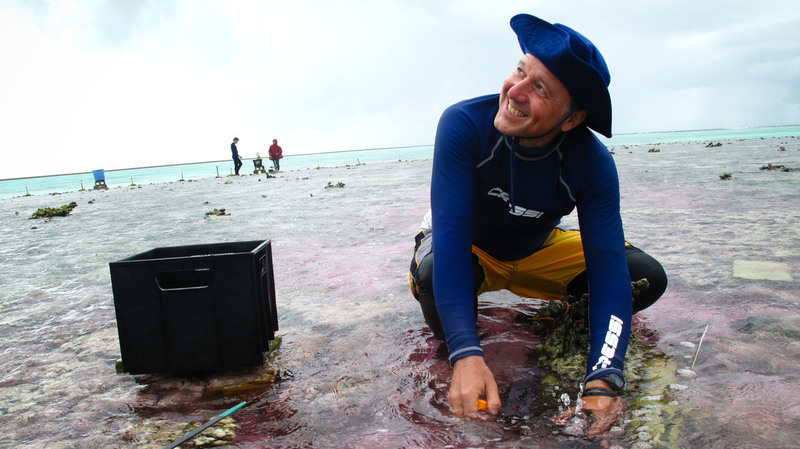 Each day, the team collects about 180 water samples from the reef at precise intervals. And they come back the next day and do it again. They've been doing this every day for more than two weeks. On this day, just as it's time to collect the water samples at the end of the experiment, a squall blows in, pummeling scientists and corals alike. Every day is different. Caldeira and his main collaborator on this experiment, Jana Maclaren, won't know until they get back to their offices on the Stanford University campus whether they can see a clear signal above the noise of natural variability. That's the risk they have gladly taken.